I have the newest addition to my line up of one-pot meal. 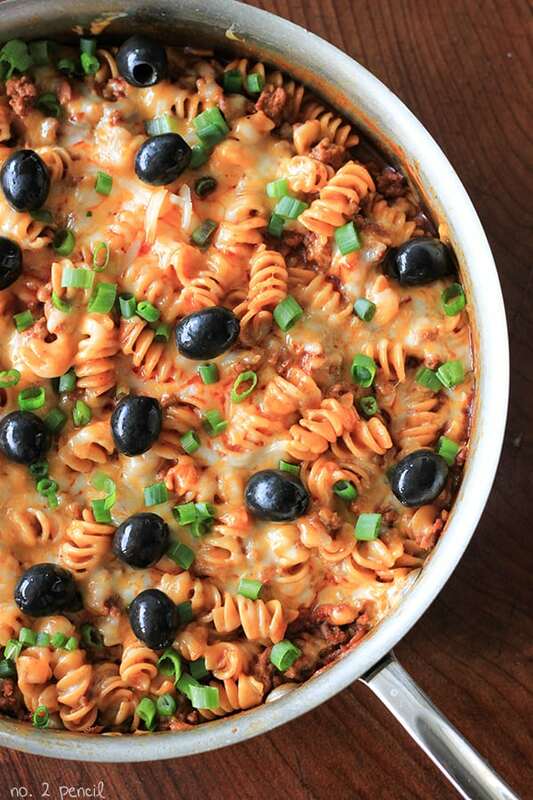 This One-Pan Enchilada Pasta is absolutely delicious. 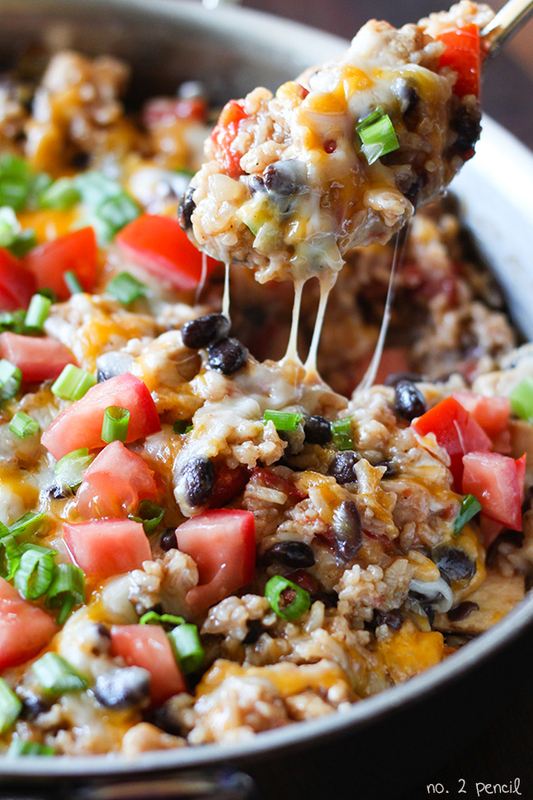 This recipe is a combination of my Skillet Enchiladas and my One-Pot Cheeseburger Casserole. Both of these recipes are reader favorites, and I know your family will love this one too. One-Pan Enchilada Pasta is a great weeknight dinner and is on the table in less than 30 minutes. The flavors of enchiladas with the family friendly comfort of pasta. This recipe is sure to make it into your regular rotation. Its just so quick and easy, and we always have these ingredients on hand. Start by sautéing onions and garlic in olive oil. Then brown ground taco turkey meat, breaking up as it cooks. 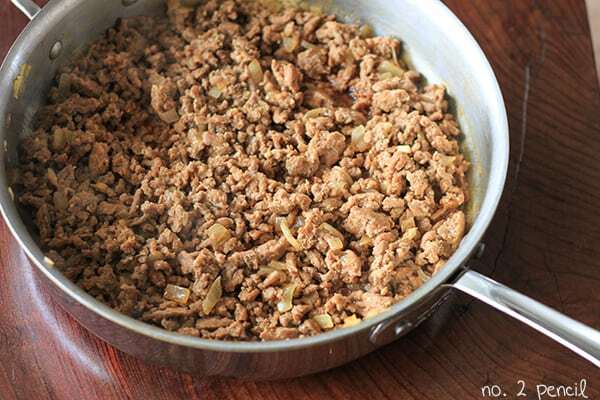 I use the Jennie-O Lean Taco Seasoned Ground Turkey for this recipe. I really love the flavor and and we use it often for our weeknight taco dinners. If you can’t find the taco seasoned turkey meat, you can substitute plain ground turkey or ground beef and either use a low-sodium taco seasoning packet or your own taco seasonings from the cupboard. This recipe is really flexible! 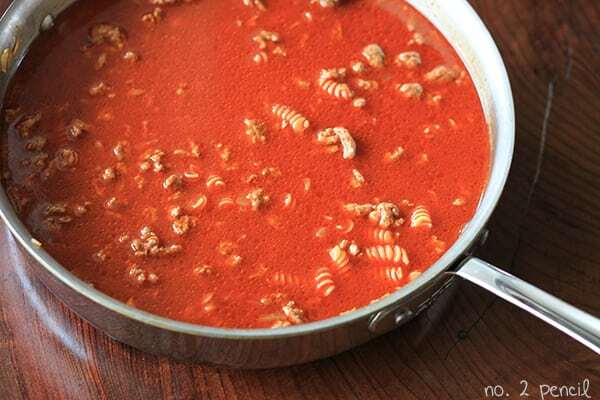 Once the ground turkey is cooked through, add pasta, low-sodium chicken broth, and enchilada sauce to pan. Bring the mixture to a boil, then reduce heat to low and cover. Cook covered on low for about 15 minutes. Then remove lid and cook uncovered for about 5 more minutes. Then you have this absolutely delicious mixture. Techinally, you could stop right here. But I really think enchiladas need plenty of cheese! Stir in 1 cup of freshly shredded cheese. I used Colby Jack because I love the way it melts! Then sprinkle additional cup of cheese on top. To melt the cheese, either run it under the broiler for a minute to two, or just cover and let the heat from the pasta melt the cheese. Sprinkle with green onions and black olives, if you love them like me. My husband is not a fan of olives, so he takes his portion without. 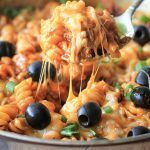 When I was testing this recipe, I was not sure about the combination of enchilada sauce and pasta, but this is absolutely delicious! I’m so thrilled I tried this combination and I know your family will love it! Links are to the products I use and love in my kitchen. In a large skillet or sauté pan, sauté garlic and onions in olive oil over medium low heat until softened. Add ground turkey meat and cook, breaking meat up with a wooden spoon until browned. Once turkey meat is cooked through, add pasta, chicken broth and enchilada sauce to pan. Bring to a boil, then reduced heat to low and cover. Cook on low, with pan covered for about 15 minutes. Then remove lid and let simmer for additional 5 minutes until pasta is tender and sauce has reduced. 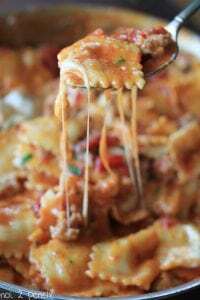 Top pasta with additional cup of cheese and melt under broiler for a minute or tow, or place lid back on pan and let heat from the pasta melt the cheese. Garnish with black olives and green onions. Pinned to my Mexican Foods board. This is definitely going on next week’s menu! Looks so yummy! I made this tonight and it’s another winner! I am always so excited to see what you come up with next! Thanks for sharing! I’m so glad, Jenn! Thank you for taking the time to comment and let me know!!! I just made this and it smells awesome! Haven’t eaten it yet, but I can’t wait to, haha. I just made it too and it is delish! 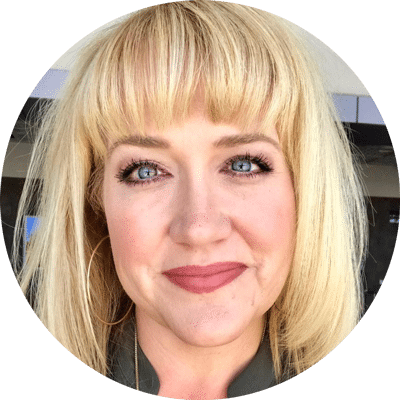 It’s like hamburger helper but better and for grownups. I added a little sour cream to mine which I thought was a yummy addition. Thanks for sharing. I made this tonight for dinner. Both my husband & I thought it was delicious!!! This recipe is a keeper! We make the skillet enchiladas and chicken alfredo at least once a month at our house. Looks like this is going in the rotation as well. Keep up the delicious work! Thank you, Andrea!I love hearing that you are using these recipes!!!! Yum this sounds so tasty!! 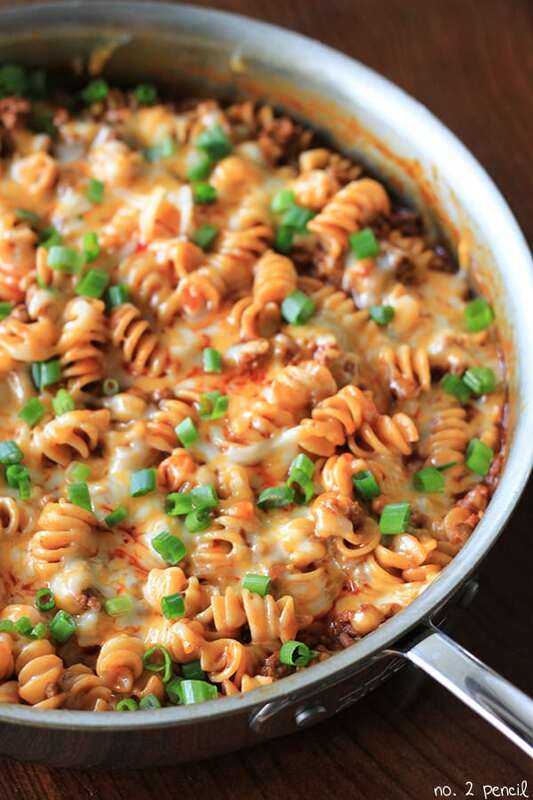 I love that it’s quick to make and only uses one pot – will be trying this soon! I made this today for the first time. I’m not much of a cook, but this was pretty easy and it came out great! I will definitely try out more of your stuff! Thanks so much!!! made this tonight.. so good! i added sour cream to top it off and it was wonderful! Hubby had 3 servings! Wonderful comfort food. I too added sour cream just because I love it. A few dashes of tobacco sauce for me. Thank you for sharing your recipe and the love that went into it! Thank you for sharing this wonderful comfort food!! I too added sour cream because I love it and plashed a few dashes of tobacco sauce for good measure. Wonderful. Definite addition to our menu cycle. I’m excited to try this out! I just want to confirm – you don’t cook the pasta beforehand? That is, it’s uncooked when it goes into the pot? Right! It goes in uncooked. Made this tonight and it’s so delicious! Thanks for the recipe! I vegetarian-ized it but I’m sure it’s delicious with meat, too! if you don’t mind me asking, how did you do that? Made this tonight with a few alterations; homemade enchilada sauce, black beans and corn instead of ground meat for a vegetarian version. Works well with whole-wheat pasta. Thanks for sharing! I skipped the ground turkey and added a drained can of black beans while simmering the pasta. Great way to add protein and perfectly complements an already delicious recipe! My family loved the taste of this meal and I loved how easy it was to make! This looks great and I cannot wait to try it. Especially since it’s going to get warmer outside and I don’t really like turning the oven on when it’s hot. The only question I have is about the chicken broth. Is it mandatory in order to make it work? I only ask because even with the low sodium everything, it can still add up. I was just wondering if it would make a difference in taste or texture if I decided not to add it. You can try substituting the chicken broth with water, I think you will loose some flavor, but it would definitely be lower in sodium! 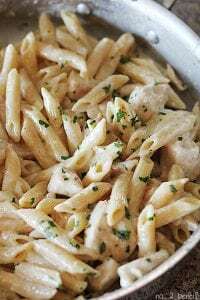 Since you are cooking the pasta in the same pan, you should keep the liquid ratios the same for this recipe. Let me know how it goes! If you are worried about the sodium you can make your own broth by boiling a chicken or turkey carcass down, which is what I had on hand and used from the freezer. You can also make your own taco seasoning using 1-2 teaspoons each of garlic powder, onion powder, cumin, paprika, and chili powder. That is what I had also, and it greatly reduces the sodium. Are you suppose to drain out any grease from the meat or leave that in? In this recipe, I used ground turkey, which didn’t leave any fat to drain. If you are using a higher fat ground beef, you can drain off the extra fat if you prefer. Making this right now – smells amazing! Will let you know how it goes… Can’t wait! A keeper for sure. Took suggestions from others and added corn and black beans. Also added red peppers, tomatoes, and jalapenos–a nice TeX Mex meal. Was still very liquidy after 15minutes, so had to boil longer. Adding plain Greek yogurt gives it the creaminess of sour cream but without the fat. Yum! Sounds great! Yes, if you add veggies they will release water into the dish, so you would need to adjust liquids or the recipe like you did. Thanks for sharing! Yes, the recipe calls for dried pasta. I made this tonight. I reduced the broth by 1/2 a cup since I added a can of black beans and a small can of corn. I also reduced the total cheese to 1 cup. It was so delish! I tried out this recipe a few nights ago. I liked the taste, but my sauce didn’t thicken at all. It was basically like soup. Just wondering if anyone else ran into this problem….it did seem like a lot of liquid to be added in the recipe. Make sure you cook the pasta in the dish, and not in a separate pan. The cooking pasta absorbed the liquid and thickens the sauce. Found this today on BuzzFeed, and decided to give it a try tonight. It’s awesome! Thank you! You can find chicken broth on the canned foods aisle, next to the soups. Just follow the directions, and it will be great!!! Happy movie night! I found this link on Buzzfeed and decided to try it for dinner tonight. It’s a HUGE hit in our house and definitely going on our list of quick/easy/cheap meals! Made this last night, it was super delicious! Easy enough for this dumb cook and filling too. What’s the oven temp supposed to be? Just took the first bit from this recipe… SO delicious!! and easy to make. I’m pretty sure my boyfriend is gonna love this when he tries it. Thank you! How much does this make? Should I double this to make a whole pound of pasta? Is that necessary? This recipe feeds 4-6 people. HOLY COW!! Just made this for dinner and it was SOOOOOO good! Thanks for an awesome recipe. My husband rated it a 5 star recipe (out of 5 stars!!) I followed recipe exactly, except I used wide noodles instead, because its what I had on hand. I also added a dollop of sour cream on top. Best skillet meal yet!! I made this over the weekend for my boyfriend, and we both loved it so much! Substitued the beef for diced chicken breast, and it turned out lovely! Definitely going to be trying some of your other recipes soon. Made this over the weekend for the boyfriend, and we both loved it so much. Substituted the beef for diced chicken breast, and it turned out delicious! Definitely going to be trying out some of your other recipes. Late comment I know, but I just wanted to say thanks for the great recipe. This was perfect for make-ahead work meals (or just lazy days). I made up a full batch (used whole wheat pasta so I added some additional water), cooked it just a bit less than the directions said and portioned it out into freezable containers. I then added the cheese, let them cool and stuck them in the freezer. Re-heated perfectly for work. Next time I may try to add some finely diced veggies into the mix like I always do with normal meat sauces. Also might try the corn and black beans suggestions from the comments. I found this on Pinterest, and made it tonight for dinner. I loved it!! I used whole wheat noodles and homemade enchilada sauce (http://michellesnewrecipes.blogspot.com/2014/01/red-enchilada-sauce.html) and it was perfect! Mine was ready after 13 minutes of covered cooking and 3 minutes of uncovered (at the end). We topped ours with guacamole and some salsa! I’m so excited to make this tonight! I’m not much of a chef but I think I can handle it. I’ll at least make the attempt. 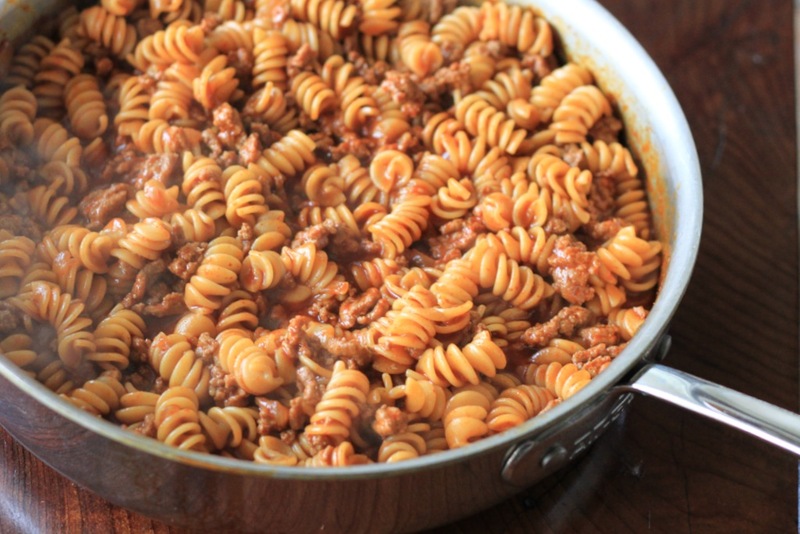 One question, I have a cast iron skillet and I was planning on using that but I don’t have a lid for it….is it totally necessary to keep the dish covered to cook the pasta? Yes, you do need a lid. The sauce will reduce too much if it’s not covered. Can you use a lid from another pot? Hopefully that will work in a pinch! Good luck! I just made it and it was really good except it was spicy! I accidentally cooked the pasta first. Is it ruined? You can try cutting back on the sauce. Hope it worked out ok! I am going to try this out tonight. I am excited I already have all the ingredients on hand. Thanks for sharing. We’ve had it twice. We all loved it. I just made this for dinner tonight and it was sooo good! I used regular ground turkey and added taco seasoning. I also used whole wheat pasta. All in all it was delicious!! Didnt see anything that said when to put the taco seasoning in? In this recipe, I used seasoned turkey meat. But if you are going to substitute taco seasoning, I would add it when adding the chicken broth and enchilada sauce. I would recommend using low-sodium taco seasoning. Thanks for the question! Thank you SO MUCH for this. I made it tonight and my kids say it’s the best thing I’ve ever made. They devoured it. Easy, cheap, and delicious. Made this last night and my husband and I both loved it. It’ll definitely be in the rotation. Thanks! Thank you! I haven’t worked on this one yet, but that’s a great idea! What a pity I can’t buy Jennie-O Lean Taco Seasoned Ground Turkey in Germany… have to look for something similar to this. Sounds delicious! Awesome dish! Super easy and super delicious. Will definitely be making this again! Thank you! Melissa, I made this dish tonight and it was easy and wonderful. I found an easy recipe for enchilada sauce and used that instead of canned. I was a little worried because we (mostly me) are wimps when it comes to heat but it was perfect. Thanks for sharing and I’ll be watching for more of your delicious recipes. And I’ll be adding this to our favorites. I have made this twice now and am going to make it again tonight, Love it! I add 3 sliced jalapenos with the onion fry at the start (i love spice!). After cooking the meat I add grated carrot and zucchini, chopped tomatoes, mushrooms, capsicum (peppers) and red kidney beans (I’m going to give the corn and black bean a try tonight). Also, the first time I cooked it the store didn’t have any enchilada sauce so I used a salt reduced spicy meatball pasta sauce, it turned out great. I made this last night with a little twist. It was a little spicy, but I think that was because of our choice in enchilada sauce. I loved how quickly this came together. Will be making it again! Have you tried with green sauce? I’m generally not a fan of the red…. Any thoughts? Made this tonight for my family…it was great! I followed the recipe exactly but my family and I found it to be too spicy. Maybe less enchilada sauce than the recipe suggests? We had to put a dollop of sour cream on top to cool it down. Such a great pasta recipe! If you’re using regular ground beef – would you recommend using beef broth instead of the chicken broth?? I would still use chicken broth! I made this tonight and it was so good! It was like a homemade version of hamburger helper, but with the right ratio of sauce to pasta, meat and cheese! Also, I absolutely LOVE taco meat, so it was a great flavor! This recipe is going in the rotation, for sure! When I made this my husband came into the kitchen, and asked, “Are you making hamburger helper?” It did remind me of that, although it was much better! I used what I had…1 small can enchilada sauce, beef broth instead of chicken, 1/2 turkey and 1/2 hamburger cooked with onion and one jalapeno, seasoned with my seasonings and egg noodles. Served with corn. Made this last night and it was wonderful! I used the whole box of pasta and it was still plenty cheesy and saucy… Had to cook the ground beef and onions and some of the seasonings on the side though since one of my daughters is a vegetarian. Can’t wait to hit the leftovers! I wonder if corn tortillas would be good to use? I wanted to double this recipe and make the whole box of pasta. How long would I need to cook it for after adding the pasta and enchilada sauce? The pasta will cook in the same amount of time. Your overall cooking time will be a little longer just because the meat will probably take longer to brown. About to make this for my annual Halloween dinner party. Wish me luck! Melissa: Your recipes ROCK. Keep up the great work.